The Indian palm squirrel also known as three-striped palm squirrel, is a species of rodent in the family Sciuridae. It is found naturally in India (south of the Vindhyas) and Sri Lanka. 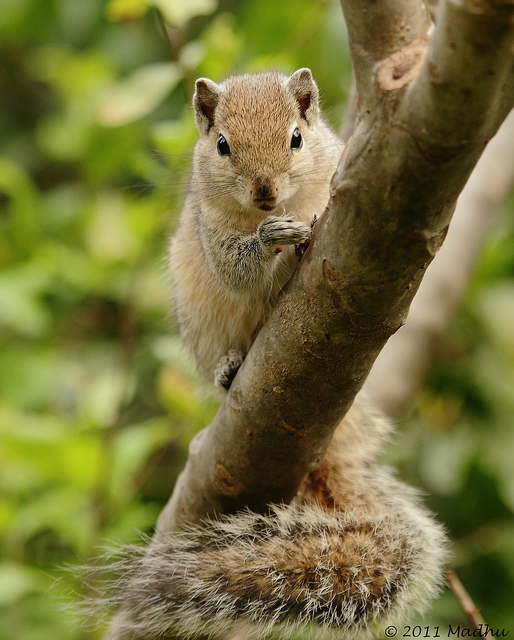 Squirrels are considered sacred in India and are not to be harmed. They are even fed by many Hindu families. This is mainly because of their association with Lord Rama. The five-striped palm squirrel (also called Northern palm squirrel) distributed over a large part of northern India and the Andaman and Nicobar Islands, the three-striped palm squirrel (also called the Indian palm squirrel) found south of the Vindhyas and Sri Lanka, the jungle palm squirrel (also called the western ghats squirrel) found in subtropical or tropical dry forests and plantations in the western ghats, the dusky palm squirrel found in some parts of India and Sri Lanka. we LOVE all of your pcis and you´ve given us great ideas!! THANK YOU! !